Manufacturer of the American Star Bicycle. Hezekiah Smith was an inventor who was born in Bridgewater, Vermont on July 24, 1816. After completing an eighth grade education, he was trained as a cabinet maker. When he was 30 years old, Hezekiah left the Woodstock area to move to Manchester, New Hampshire. Once there, he made a living carving wooden patterns but he also developed an interested in the machine business. From Manchester, Smith moved to Lebanon, New Hampshire where he began to manufacture items with custom specifications. From there, he moved to Boston, Massachusetts where he began a business to manufacture woodworking machinery. He subsequently moved his business to Lowell, Massachusetts. In 1865, Smith visited with a Benjamin Shreve in Medford, New Jersey. Smith managed to acquire from Shreve almost the entire town of Shreveville, New Jersey for $20,000 and he renamed it Smithville. By this time, Smith had over forty patents for his inventions. Having established himself as a successful inventor, businessman, and substantial land owner, he established the H.B Smith Machine Company. His business was incorporated in 1878. 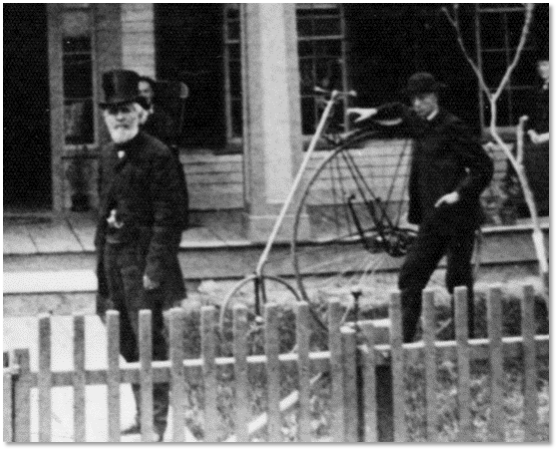 In addition to the manufacture of woodworking tools and machinery he also produced the American Star Bicycle. 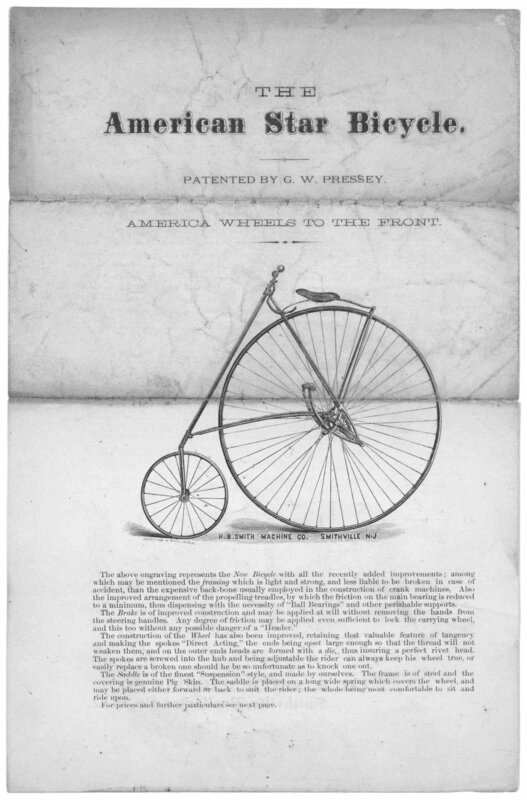 The bicycle was patented in 1880 by George W. Pressey, an employee at Smith’s company. Library of Congress, Rare Book and Special Collections Division, Printed Ephemera Collection. Will Robertson famously rode down the steps of the Capital Building in Washington, D.C. in 1885 to illustrate how stable the bicycle was. The American Star differed from other Ordinary bicycles of the time. The large wheel was moved to the back for greater stabilization and increased safety for the rider. It also had the advantage that it could be ridden very fast as both feet could be pushed on the treadles simultaneously, an advantage in riding up hills and starting off in races. The American Star sold for $150 at the time. This was quite expensive as the average person in America earned about $500 a year. Although it was not a great commercial success, it was a great advertising tool for the H.B. Smith Machine Company. By the 1890s, the American Star and other high wheelers became less popular with the development of the safety bicycle and improvements to the pneumatic tire. By 1893, the company only produced fifty bicycles and it appears that they ceased this operation that same year. In the late 1880s, the American Star was seen around the village of Woodstock, especially around The Park (now called the Green). The following image show a detail of a photograph of several boys posing with their Ordinaries in front of the Norman Williams Public Library. These three boys are holding their American Star bicycles. The additional photo shows a detail of J.R. Murdock’s house, The Three Gables, on the Green in Woodstock and a young man posing with his American Star. A bicyclist in 1990s on an American Star at the Billings Farm & Museum. George Hart: "A Very Worthy Citizen"